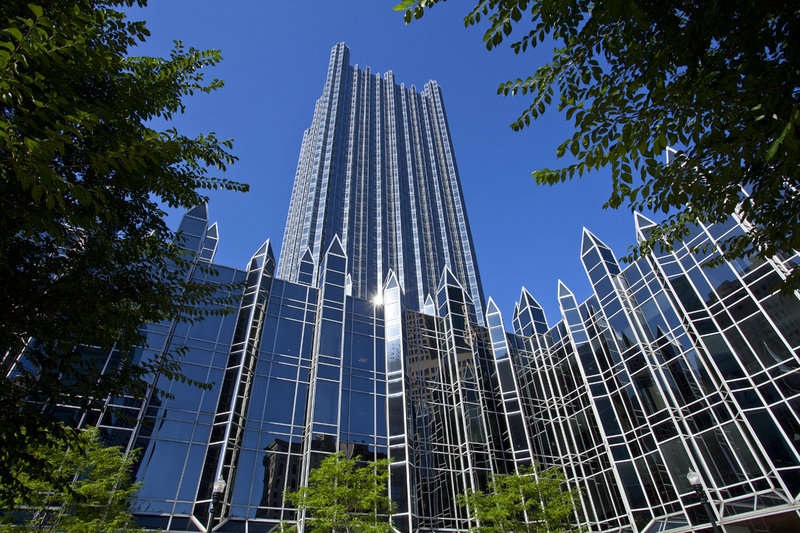 Renowned architects Philip Johnson and John Burgee designed PPG Place (completed in 1984), clad in almost a million square feet of glass manufactured by the anchor tenant PPG Industries. The design melds a modern corporate tower with a neo-gothic monument and explored the nature of mirrored glass, light and color. A Docent will be onsite to provide you additional information about PPG buildings. The gleaming glass and steel structures, known worldwide for their breathtaking design, were developed by John Burgee Architects with the internationally renowned architect Philip Johnson from New York. This complex with its thicket of 231 spires was designed to weave into the architecture of Pittsburgh and recall the city’s great buildings, such as the Cathedral of Learning and the Allegheny County Courthouse. PPG Place’s neo-Gothic forms are the perfect architectural bridge between the historical structures of the city and the newer geometrical high-rise towers. Nearly one million square feet of PPG Solarban 550 clear reflective glass was used, which provides a high degree of energy efficiency unmatched in many buildings. The expansive tower lobbies are paneled in PPG Spandrelite Glass and the elevators are enhanced with a laminated cracked glass mirror. The grandeur and sophistication of PPG Place does not mask its function as a gathering place for Pittsburgh area residents and visitors alike. The Wintergarden, Plaza, and Arcade areas embrace the public with a sense of welcome.